Could someone help me to identify this station please? I received it on 102.5MHz on June 3, 2018 via SpE in Brindas, France. I'm almost sure this is a station from Eastern Europe but I can't recognize the language and the ID at 00:48. Re: UNID on 102.5 / Eastern Europe? The language, the mention of 'Stara Zagora' and talk about migrants in Turkey leads me to think that this is from Bulgaria. My vote would be for BNR Horizont from Nesebăr. and yet another corri-talk, announced by the news presenter, this time taken from telephone ("od Svilengrad...[name]...B'lgarske natsionalne radio") at 45 sec. followed by only a news bumper, there is no voice ID or jingle ID in it, only pure sound effect bumper. next news item is about 9 immigrants, quoting France press. from the information given, lets me think about the process which was hold in Hungary. that was about criminals who let 71 illegals die within a camion / freight waggon on an autoroad near Burgenland Austria some years ago. today, the trial was set in Southern Hungaria because they are suspected to have died within Hungary. this is BNR for sure. Thank you both very much for your information! Unfortunately, the ID of the reporter saying "prename, surname...B'lgarske natsionalne radijo" is swamped out by fading...this would have been much easier. But if you know the station and the way its news is presented, you can be sure. Good news! 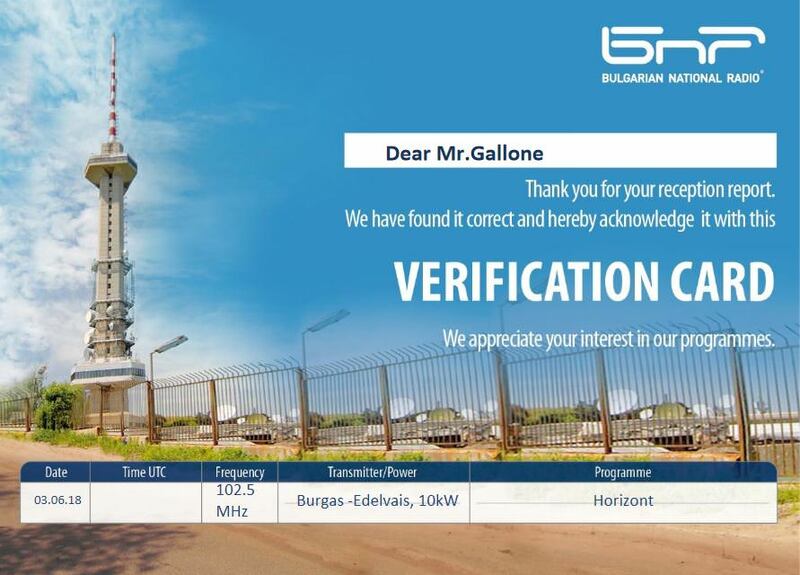 I received an eQSL for this reception so we are 100% sure that it was BNR Horizont.